Induced pluripotent stem (iPS) cells, obtained from reprogramming somatic cells by ectopic expression of a defined set of transcription factors or chemicals, are expected to be used as differentiated cells for drug screening or evaluations of drug toxicity and cell replacement therapies. As pluripotent stem cells, iPS cells are similar to embryonic stem (ES) cells in morphology and marker expression. Several types of iPS cells have been generated using combinations of reprogramming molecules and/or small chemical compounds from different types of tissues. A comprehensive approach, such as global gene or microRNA expression analysis and whole genomic DNA methylation profiling, has demonstrated that iPS cells are similar to their embryonic counterparts. Considering the substantial variation among iPS cell lines reported to date, the safety and therapeutic implications of these differences should be thoroughly evaluated before they are used in cell therapies. Here, we review recent research defining the concept of standardization for iPS cells, their ability to differentiate and the identity of the differentiated cells. During mammalian development, cells in the developing fetus gradually become more committed to their specific lineage. The cellular differentiation process specializes to achieve a particular biological function in the adult, and the potential to differentiate is lost. Cellular differentiation has traditionally been thought of as a unidirectional process, during which a totipotent fertilized zygote becomes pluripotent, multipotent, and terminally differentiated, losing phenotypic plasticity (Figure 1). However, recent cloning experiments using nuclear transplantation have demonstrated that the epigenetic constraints imposed upon differentiation in mammalian oocytes can be released and the adult somatic nucleus restored to a totipotent embryonic state . This process, a rewinding of the developmental clock, is termed nuclear reprogramming. Hierarchical potential of stem cell development. A totipotent cell, such as a zygote and a blastomere of an early pre-implantation embryo, can give rise to all of the cell types in the whole body and the extraembryonic tissues. During mammalian development, pluripotent cells of the inner cell mass differentiate to give rise to lineage-committing stem cells and progenitor cells, and finally terminally differentiated cells by losing differential potential. Embryonic stem (ES) cells are spun off directly from the inner cell mass of blastocysts and induced pluripotent stem (iPS) cells are generated by reprogramming differentiated cells back to the pluripotent state. ES cells and iPS cells seem to have highly similar pluripotential properties. Embryonic stem (ES) cells derived from the inner cell mass of the mammalian blastocyst, an early-stage embryo, were first established from mice by Evans and Kaufman in 1981 . Approximately two decades later, a human ES (hES) cell line was established by Thomson and colleagues . ES cells possess a nearly unlimited capacity for self-renewal and pluripotency: the ability to differentiate into cells of three germ layers. This unique property might be useful to generate a sufficient amount of any differentiated cell type for drug screening or evaluations of drug toxicity and for cell replacement therapy. In addition, pluripotent stem cells provide us with an opportunity to understand early human embryonic development and cellular differentiation. Pluripotent ES cells are spun off directly from pre-implantation embryos [2–5]. To induce the somatic cell back to a pluripotent state, a strategy such as nuclear transplantation is fraught with technical complications and ethical issues. Thus, the direct generation of pluripotent cells without the use of embryonic material has been deemed a more suitable approach that lends itself well to mechanistic analysis and has fewer ethical implications . In a breakthrough experiment, Takahashi and Yamanaka  identified reprogramming factors normally expressed in ES cells, Oct3/4, Sox2, c-Myc, and Klf4, that were sufficient to reprogram mouse fibroblasts to become pluripotent stem cells closely resembling ES cells. Because they were induced by the expression of defined factors, these cells were termed induced pluripotent stem (iPS) cells . Since this landmark report in 2006, the technology has been rapidly confirmed among a number of species, including humans [8, 9], rhesus monkeys , rats [11, 12], rabbits , pigs  and two endangered primates . In addition, mouse iPS (miPS) cells can be derived from various cell types, including fibroblasts [7, 16], neural cells [17, 18], liver cells , pancreatic β cells , and terminally differentiated lymphocytes [21, 22]. Subsequently, human iPS (hiPS) cells have been derived from various readily accessible cell types, including skin fibroblasts [8, 9], keratinocytes , gingival fibroblasts , peripheral blood cells [25, 26], cord blood cells [27, 28] and hair follicle cells . These products and systems for this state-of-the art technology provide useful platforms for disease modeling and drug discovery, and could enable autologous cell transplantation in the future. Given the methodologies for studying disease mechanisms, disease- and patient-specific iPS cells can be derived from patients. For applying novel reprogramming technologies to biomedical fields, we need to determine the essential features of iPS cells. In this review, we summarize the functional and molecular properties of iPS cells in comparison to ES cells in the undifferentiated state and with regard to differentiation efficiency. We also review evaluation for the types of differentiated cells derived from of iPS and ES cells and compare the functions of these. 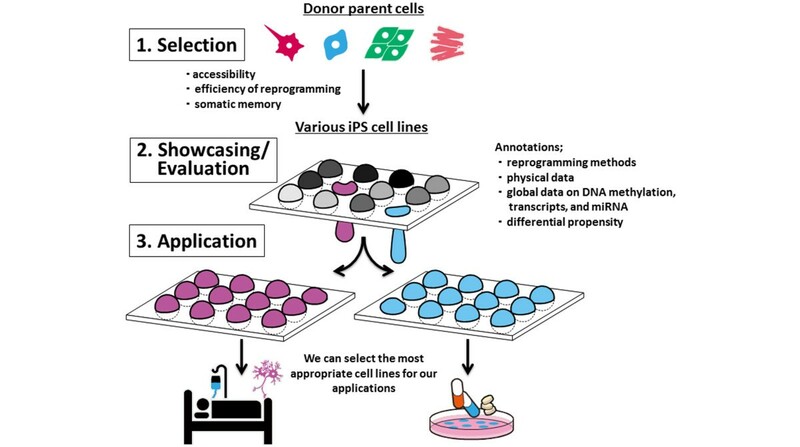 Although the establishment of iPS cells from somatic cells is technically easier and simpler compared with nuclear transplantation, several variables should be considered due to variations in the reprogramming process, including the reprogramming factors used, the combinations of factors and the types of donor-parent cells. Each method has advantages and disadvantages, such as efficiency of reprogramming, safety, and complexity, with the process used affecting the quality of the resultant iPS cells. Initial generations of miPS and hiPS cells employed retroviral and lentiviral vectors [7–9] (Table 1), carrying the risk of both insertional mutagenesis and oncogenesis due to misexpression of the exogenous reprogramming factors, Oct3/4, Sox2, c-Myc, and Klf4. In particular, reactivation of c-Myc increases tumorigenicity in the chimeras and progeny mice, hindering clinical applications. aO, OCT3/4; S, SOX2; K, KLF4; M, C-MYC; M*, L-MYC; N, NANOG; L, LIN28. ALK, anaplastic lymphoma kinase; BayK8644, L-type calcium channel agonist; BIX01294, histone methyltransferase inhibitor; BMP, bone morphogenetic protein; GSK, glycogen synthase kinase; GLIS, GLI (MIM 165220)-related Kruppel-like zinc finger; LIF, leukemia inhibitory factor; PDK, pyruvate dehydrogenase kinase; shRNA, short hairpin RNA; siRNA, small interfering RNA; TGFBR, transforming growth factor beta receptor; UTF, undifferentiated transcription factor; VPA, valproic acid (histone deacetylase inhibitor). Since the initial report of iPS cell generation, modifications to the reprogramming process have been made in order to decrease the risk of tumorigenicity and increase reprogramming efficiency [30–32]. Several small molecules and additional factors have been reported to enhance the reprogramming process and/or functionally replace the role of some of the transcription factors (Table 1). Small molecules are easy to use and do not result in permanent genome modifications, although iPS generation using only a set of small molecules has not been reported. Combining small molecule compounds with reprogramming factors would enhance reprogramming efficiency. Integration-free hiPS cells have been established using Sendai virus [33, 34], episomal plasmid vectors [35, 36], minicircle vectors , and direct protein [38, 39] or mRNA  delivery (Table 1). However, direct delivery of proteins or RNA requires multiple transfection steps with reprogramming factors compared to other viral integration methods. The key to generating iPS cells is to revert somatic cells to a pluripotent state that is molecularly and functionally equivalent to ES cells derived from blastocysts (Table 2). Reprogrammed iPS cells express endogenous transcription factors that are required for self-renewal and maintenance of pluripotency, such as OCT3/4, SOX2, and NANOG, and for unlimited proliferation potential, such as TERT [8, 9]. Telomeres were elongated in iPS cells compared to the parental differentiated cells in both humans and mice [41, 42]. In addition, cellular organelles such as mitochondria within hiPS cells were morphologically and functionally similar to those within ES cells . The establishment of an ES cell-like epigenetic state is a critical step during the reprogramming of somatic cells to iPS cells and occurs through activation of endogenous pluripotency related genes. Bisulfite genomic sequencing has shown that the promoter regions of the pluripotency markers NANOG and OCT3/4 are significantly demethylated in both hiPS and hES cells [8, 44], and the heterogeneity of × chromosome inactivation in hiPS cells is similar to that in ES cells . ES, embryonic stem; hES, human embryonic stem; hiPS, human induced pluripotent stem; iPS, induced pluripotent stem; mtDNA, mitochondrial DNA; XCI, × chromosome inactivation. In terms of multilineage differentiation capacity, miPS cells from various tissue types have been shown to be competent for germline chimeras [19, 32, 46]. It was shown that miPS cells generated viable mice via tetraploid complementation [47, 48]. In the mouse system, iPS cells retain a developmental pluripotency highly similar to that of mouse ES cells according to the most stringent tests. Although it has been generally assumed that autologous cells should be immune-tolerated by the recipient from whom the iPS cells were derived, Zhao and colleagues  reported that the transplantation of immature miPS cells induced a T-cell-dependent immune response even in a syngeneic mouse. This is an unexpected result but some issues need to be considered: the influence of the cell type of origin on the immunogenic properties of resultant iPS cells must be explored; undifferentiated iPSCs should never be used for medical applications; and the mechanism of aberrant gene expression should be determined . To functionally assay hiPS cells, teratoma formation and histological analysis to confirm the presence of structures derived from all three germ layers are currently regarded as the most rigorous ways to prove pluripotency of human stem cells. Recently, Müller and colleagues  proposed the use of PluriTest, a bioinformatics assay for the prediction of stem cell pluripotency using microarray data. Such microarray-based gene expression and DNA methylation assays are low cost, save time and have been used to evaluate the differentiation efficiency of individual cell lines . Epigenetic modification of the genome ensures proper gene activation for maintaining the pluripotency of stem cells and also differentiation into proper functional cells . It will be important to assess the epigenetic state of hiPS cells compared to donor parent cells and embryoderived hES cells. Analyzing epigenetic states, such as histone modifications and DNA methylation of selected key pluripotency genes, showed the chromatin state of iPS cells to be identical to that of ES cells upon reprogramming (reviewed in ). Genome-wide analyses of histone methylation patterns have demonstrated that iPS cells were clearly distinguished from their origin and similar to ES cells in the mouse . All of these analyses, however, reported some differentially methylated regions (DMRs) between ES and iPS cells. Recent studies found that miPS cell lines retained the residual signatures of DNA methylation of the parental cells [55, 56]. Additionally, some of the hyper-methylated regions in hiPS cells are also hyper-methylated in the original cells, meaning that an epigenetic memory is inherited during the reprogramming process through early passaging . Parental cell-related DMRs and incomplete promoter DNA methylation contributed to aberrant gene expression profiles in iPS cells to some extent . The other remaining DMRs appeared to be aberrantly methylated regions established in iPS cells during reprogramming that differ from both the parental cells and the ES cells. Nishino and colleagues  compared methylation profiles of six hiPS cell lines and two hES cell lines and reported that approximately 60% of DMRs were inherited and 40% were iPS-specific. Interestingly, most aberrant DMRs were hyper-methylated in iPS cell lines [57, 59]. Lister and colleagues  also compared methylation profiles in five hiPS cell lines and two hES cell lines and found that the hiPS cells shared megabase-scale DMRs proximal to centromeres and telomeres that display incomplete reprogramming of non-CpG methylation, and differences in CpG methylation and histone modifications in over a thousand DMRs between hES and hiPS cells. Although lots of studies have detected several DMRs shared between iPS and ES cells, no DMRs were found in all iPS cell lines. microRNAs (miRNAs), which are also epigenetically regulated, play critical roles in gene regulation by targeting specific mRNAs for degradation or by suppressing their translation. Several studies recently reported the presence of unique clusters of miRNAs, such as the human and mouse miR-302 cluster in ES and iPS cells [61, 62]. These miRNAs enhance the transcription factor-mediated reprogramming process (Table 1). Furthermore, two independent groups generated human and mouse iPS cells by adding only miRNAs in the absence of any additional protein factors [63, 64]. Two reports have described a small number of differences in miRNA expression patterns between hiPS and hES cells [62, 65], although our preliminary analysis showed that miR-372 and miR-373 are expressed at similar levels in both hiPS and hES cells and they were not detected in parental cells. It is possible that iPS cells vary in their epigenetic profiles and degree of pluripotency due to differential levels of reprogramming. Nishino and colleagues  investigated the effect of continuous passaging on DNA methylation profiles of seven hiPS cell lines derived from five cell types. Although de novo DMRs that differ between hES and hiPS cells appeared at each passage, their number decreased and they disappeared with passaging; therefore, the total number of DMRs that differ between ES and iPS cells decreased with passaging. Thus, continuous passaging of the iPS cells diminished the epigenetic differences between iPS and ES cells, implying that iPS cells lose the characteristics inherited from the parental cells and develop to very closely resemble ES cells over time . They also confirmed that the transgenes were silenced at each passage examined, indicating that the number of DMRs that differed between ES and iPS cells decreased during the transgene-independent phase. This is consistent with a study by Chin and colleagues , who found that the gene expression profile of hiPS cells appeared to become more similar to that of hES cells upon extended passaging. Although comprehensive DNA methylation profiles have recently been generated for hiPS cells, it seems harder to determine common DMR sites during iPS reprogramming. There are three possible explanations for the many inconsistent results regarding iPS cell-specific DMRs: hiPS cells have only been analyzed at a single point of passage in almost all studies; inherited methylation from parental cells is non-synchronous and stochastic, much like aberrant methylation, rather than deterministic ; and the aberrant hyper-methylation at DMRs in iPS cells occurs 'stochastically' throughout the genome during passaging . Genomic stability is critical for the clinical use of hiPS cells. The occurrence of genetic changes in hES cells is now well known as well as that the karyotypic changes observed are nonrandom and commonly affect only a few chromosomes . Recent studies revealed that the reprogramming process and subsequent culture of iPS cells in vitro can induce genetic changes. Three types of genomic abnormalities were seen: aberrations of somatic cell origin, aberrations present in early passages but not of apparent somatic cell origin, and aberrations acquired during passaging. Notably, the high incidence of chromosome 12 duplications observed by Mayshar and colleagues  caused significant enrichment for cell cycle-related genes, such as NANOG and GDF3. Another study reported that regions close to pluripotency-associated genes were duplicated in multiple samples . Selection during hiPS cell reprogramming, colony picking and subsequent culturing may be factors contributing to the accumulation of mutations. One of the goals of using hiPS cells is to generate functional target cells for medical screening and therapeutic applications. For these applications, it must be evaluated thoroughly whether small DMRs among ES and iPS cells affect the competency, differentiation propensities, stability and safety of iPS cells. It remains to be elucidated how the degree of these differences contributes to the variance in pluripotency among ES and iPS cells. Analysis of iPS cells obtained from mouse fibroblasts and hematopoietic and myogenic cells demonstrated that cellular origin influences the potential of miPS cells to differentiate into embryoid bodies and different cell types in vitro. In a related study, Kim and colleagues  compared the ability to differentiate to blood lineages of iPS cells derived from fibroblasts, neural cells, hematopoietic cells and ES cells in the mouse system, and demonstrated consistent differences in blood-forming ability - that is, blood derivatives showed more robust hematopoiesis in vitro than neural derivatives. Therefore, low-passage iPS cells derived from different tissues harbor residual DNA methylation signatures characteristic of their somatic tissue of origin, which favors their differentiation along lineages related to the parental cell, while restricting alternative cell fates. Similarly, Miura and colleagues  demonstrated that differences in gene expression in miPS cells derived from different types of parental cells result in variations in teratoma formation. These studies demonstrate that reprogramming to generate iPS cells is a gradual process that modifies epigenetic profiles beyond the acquisition of a pluripotent state. Significant variation has been also observed in the differentiation efficiency of various hES cell lines . Incomplete DNA methylation of somatic cells regulates the efficiency of hiPS cell generation , and selection of parental cell types influences the propensity for differentiation [73, 74]. Such differences must be better understood before hES and hiPS cell lines can be confidently used for translational research. To predict a cell line's propensity to differentiate into the three germ layers, Bock and colleagues  performed DNA methylation mapping by genome-scale bisulfite sequencing and gene expression profiling using microarrays and quantified the propensity to form multiple lineages by utilizing a non-directed embryoid bodies formation assay and high-throughput transcript counting of 500 lineage marker genes in embryoid bodies using 20 hES cells lines and 12 hiPS cell lines over passages 15 to 30. They bioinformatically integrated these genomic assays into a scorecard that measures the quality and utility of any human pluripotent cell line. The resulting lineage scorecard pinpoints quantitative differences among cell-line-specific differentiation propensities. For example, one hES cell line that received a high score for endoderm differentiation performed well in directed endoderm differentiation, and other hES cell lines that received high scores for neural lineage differentiation efficiently differentiated into motor neurons. In addition, two hiPS lines that the scorecard predicted to have a low propensity to differentiate into the neural lineage were impaired in motor neuron-directed differentiation. On the other hand, other hiPS lines that the scorecard predicted to have a high propensity to differentiate into ectodermal and neural lineages were found to differentiate well into motor neurons. Therefore, the scorecard can detect lineage-specific differences in the differentiation propensities of a given cell line . Although the propensity for differentiation could be predicted, it remains to be elucidated whether iPS cell-derived cells are functionally and molecularly the same as ES cell-derived cells. To address this issue, two studies conducted functional assays comparing differentiated neural cells derived from iPS cells to those derived from ES cells by marker gene expression and action potential measurements [75, 76]. There was some variation in efficiency and quantitative differences in motor neuron generation among the lines, but the treatment of neuroepithelial cells from pluripotent stem cells with retinoic acid and sonic hedgehog resulted in the generation of iPS and ES cell lines with a neuronal morphology that expressed TUJ1. In addition, electrophysiological recordings using whole-cell patch clamping showed inward and outward currents, and it was concluded that ES cell- and iPS cell-derived neurons are similarly functional at a physiological level. These studies demonstrated that the temporal course and gene-expression pattern during neuroepithelial cell differentiation and production of functional neurons were nearly identical between ES and iPS cells, regardless of the reprogramming method, cellular origin, and differences between iPS and ES cells. These findings raise hopes of applying human iPS cells to the modeling of diseases and potential autologous cell transplantation. It is important to acquire scientific information on pluripotential stem cells for further applications, such as industrial and clinical uses. Pluripotent stem cells, including disease-specific stem cells, could be showcased with useful annotation data and the most appropriate cell lines could be selected (Figure 2). Workflow for human iPS cell applications. 1. Selection: choosing donor parent tissue considering accessibility, efficiency of reprogramming, and differential propensity. It would be useful to evaluate the expression of somatic memory genes, such as C9orf64, which reduces the efficiency of induced pluripotent stem (iPS) cell generation . 2. Showcasing/evaluation: provides annotated information on reprogramming methods, culture conditions, physical data on stem cells, and global data on DNA methylation, transcription and microRNAs (miRNAs). It is very informative to integrate the genetic and epigenetic and biological data, such as differential propensity [52, 76]. 3. Application: using annotation data, we can select the most appropriate iPS cell lines for our applications. Various hiPS cell lines (shown as differently shaded spheres) would be listed before further processing of the application. Valid cell lines (colored purple and blue) could be functionally and molecularly selected for appropriate applications, such as cell replacement therapy and/or drug screening. Many issues have yet to be resolved before the results of stem cell research can benefit the public in the form of medical treatments. In this review, we have discussed the substantial variation observed among pluripotent stem cells, including transcriptional and epigenetic profiles in the undifferentiated state, the ability to differentiate into various types of cells, and the functional and molecular nature of embryoid body or stem cell-derived differentiated cells. These results suggest that most, but not all, iPS cell lines are indistinguishable from ES cell lines, even though there is a difference between the average ES cell and the average iPS cell. Thus, ES and iPS cells should not be regarded as one or two well-defined points in the cellular space but rather as two partially overlapping point clouds with inherent variability among both ES and iPS cell lines [52, 76]. Notably, human iPS cells seemed to be more variable than human ES cells. No single stem cell line may be equally powerful for deriving all cell types in vitro, implying that researchers would benefit from identifying the best cell lines for each application. Furthermore, for clinical use in the future, it is important to use both ES and iPS cells in research, and to standardize reprogramming methods, culture equipment and techniques and to optimize differentiation methods and evaluate the functions and tumorigenicity of differentiated cells. We apologize to those authors whose publications could not be mentioned here owing to space constraints. We are grateful to Dr D Egli for critical reading of this manuscript, Y Suehiro for preparing figures, and other members of our laboratory for stimulating discussion. This work was supported by grants from the Ministry of Education, Culture, Sports, Science and Technology (MEXT) of Japan; a grant from the Ministry of Health, Labour and Welfare Sciences (MHLW) to HA, AU; a Grant-in-aid for Scientific Research (21390456) to HA, and (22770233) to TS; a grant from New Energy and Industrial Technology Development Organization (NEDO) in Japan given to HA; and a grant from JST-CREST given to HA.